And The Facts Must Be Suppressed! 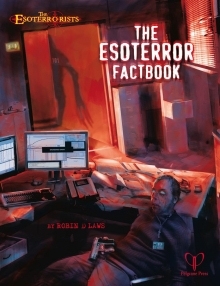 Ripped from the secret files of the Ordo Veritatis, the the Esoterror Fact Book briefs you on what you need to send players into intrigue-filled confrontation with forces of international terror bent on supernatural apocalypse. Study the Operations Manual to master the procedures and protocols of the Ordo Veritatis, from recruitment to the veil-out. Examine Station Duty to get support for fixed-location campaigns in the world of Esoterror – it's not just the OV facing the entities of the outer dark, it's your friends and family. When monster hunting gets too hairy for ordinary investigators, call in the Special Suppression Forces to sweep ‘em up. Pulse-pounding and reeking of cordite, this section includes both background material and optional crunchier combat rules for paramilitary GUMSHOE play. The Enemy rushes the freshest knowledge on the Esoterrorists into your players’ hands. Learn the latest on suspected Esoterror cells, their personality types, financing and organization. Unaffiliated Operatives profiles nine figures in the world of supernatural ops whose twisting allegiances may make them your untrustworthy friends—or troublesome adversaries who play outside the usual rules. Dread Locations explores eleven haunted places where the membrane between this world and the Outer Dark has grown terrifyingly thin. Hone your GUMSHOE skills with a quick dispatch of the latest GM Advice. Astute players, take note—this section can help you sharpen your game, too! Covering everything from the membrane to magic, from electronic surveillance to evidence collection, the Fact Book is the Ordo Veritatis bible. Read it before the Esoterrorists do! This title was added to our catalog on May 20, 2009.